"If I have seen farther than others it is because I have stood on the shoulders of giants" - Sir Isaac Newton. Tyler just read a Ray Bradbury book about how even the slightest changed can have big effects in one's life. It is called the, "Sound of Thunder". We also watched the movie for extra credit. Why am I running today? Because I know of several individuals that have run and it has changed their lives. My brother, Thom, ran the NYC Marathon back in 1996. I didn't realize how big it was back then. Thom does lots of interesting things, but running the marathon may be one of the bigger things he's done. I recently got on the internet to see results from the NYC Marathon. Thom not only finished the race, but he did it around 6 hours. Now that's not blazing, but you do have to train for a time like that. Thanks Thom for being an inspiration. I recently learned my cousin, David Monahan participated in the IronMan Triathlon in Phoenix. That's unbelievable. He swam 2.4 miles, biked 112 miles and then ran 26.2 miles all in about 14 hours. When I was back visiting relatives I noticed my sister in law, Raegan Potter had lost a bunch of weight and was looking very healthy. She said she was running something like 4 miles a day. I forget her times and whether she has been in any races. I'll have to email her to find out more. These are just three examples of people in my life that have influenced me to run. This is my D'Arcy Ranch Loop. It's one mile long and I run it then walk back to the start and run it again. It's in Chandler, AZ near the Chandler Fashion Center. 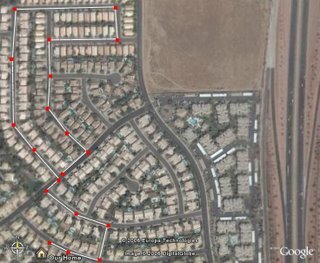 I use google earth to measure my routes. Tonite I ran a 11:49 first mile. Walked back to the start and ran a 12:49 second mile. 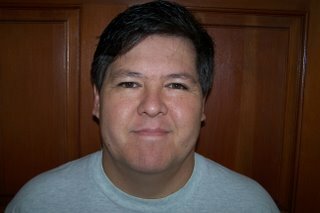 Thanks to my son Tyler for helping me get this picture on my blog. He used Windows Paint to save this on my computer. This is the first of my bi weekly weigh ins. You get pictures, weights, inches and all the gory details. In June when I started this running thing I weighed 257 lbs. On August 2nd when I kicked my running into high gear I weighed 251.5 lbs. And these were the good pictures. I picket out this t shirt because I always liked it, but didnt' wear it because it was too tight. I thought for the photos I should wear something tight. Of course, now it's not as tight as it used to be. I'm also a big Reds fan and they are in the hunt for a playoff spot this year. Yeah! I started keeping a journal: August, 2006. Friday the 25th: I ran 3.3 miles in about 50 minutes. The weather was much better. It rained earlier in the day, which is rare for the Phoenix area. The tempature at my run time, 8 pm was 84*.The humidity was up there at 56%. Saturday the 26th: 3.3 miles in 46:27. About a 13 minute pace in 91* weather. 30% humidity. My 3 mile time was under 40 minutes for the first time: 39:57. I picked up the pace for the last 30 seconds, because I knew I could get under 40 minutes. Sunday the 27th: I ran 4 miles for the first time. I say run, eventhough I walk some of it. This run started with walking the first mile with my wife and two kids. The last 3 miles I went solo and ran at least half of it. 95*, 30%, 8 pm. Monday the 28th: I guess I got inspired and so I ran 5 miles. Again I walked quite a bit of it. But, that's ok with me. The first mile was all running and I finished at 12:31. I did the first three miles in 44:41. 95*, 30%, 8 pm. Tuesday the 29th: 2.67 miles. 2 miles at 23:54, 11:57 pace. 98*, 33%, 8 pm. I mapped out a new course thru D'Arcy Ranch. This was my fasted two mile run. The first lap was 11:46 and the second was 12:08. My time usually goes up alot more on the second and third miles. 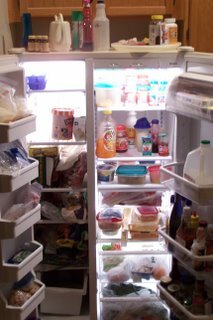 Pictures of the fridge. I have been reading the posts at runnersworld.com recently. 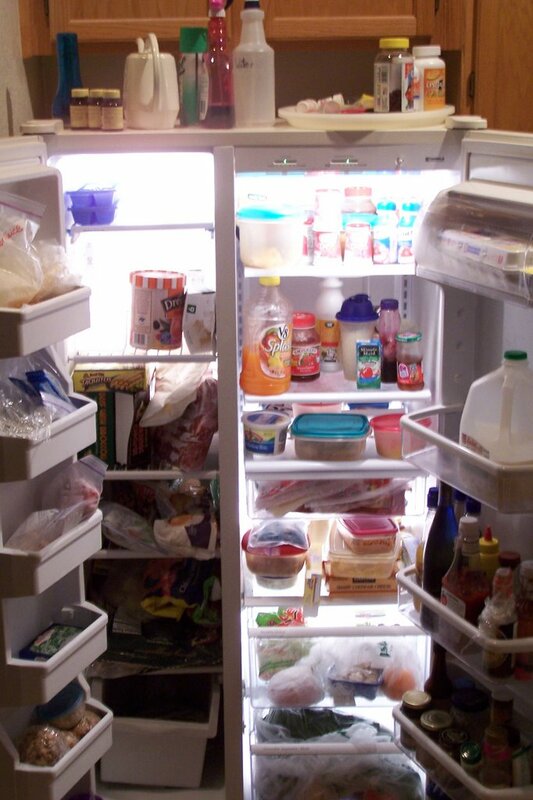 In one of them, a man posted pictures of his fridge and what his wife bought for them. It had lots of vegetables. Ours as you can see doesn't. 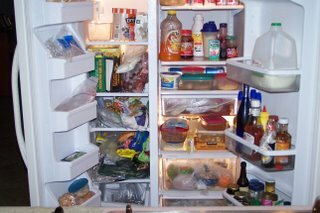 We do eat vegetables and there are some in the drawers below, but not as many. 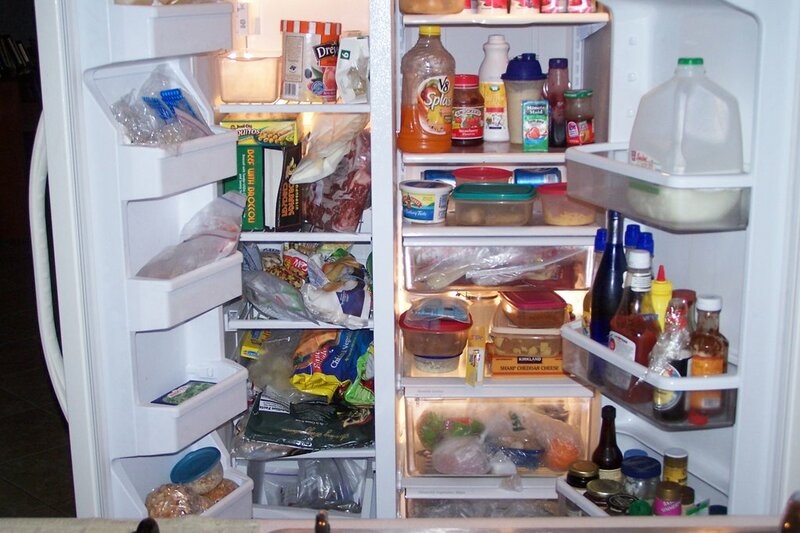 There is now a link at runnersworld were people can post pictures of their fridge. I did, but first had to put them here. I've been reading that site a lot lately and therefore have not posted here as much. I will get back in the habit of journaling here for my own sake, as well as for anyone that might stumble across my blog. I walked a mile with Amy & Tyler. Then ran a mile by myself. It was a bit under 12 minutes. I enjoyed it a bit more than usual. At first I was having trouble getting enough air. Asthma. But, when I ran with my head up looking at the lightposts tops, I seemed to do better. Maybe I've been looking at the ground or too low and its effected my breathing. I'll see how I do tomorrow. this is the fourth week since I started keeping a log. Just four weeks ago I was dealing with a sore achilles in my left leg, I weighed about 251 and I was doing about 10 miles a week. This week my goal is to do 15 miles, weigh less than 245 and enjoy all my runs. Last night I ran 3 miles (mostly ran) in 41:49. splits of 13:30, 13:50 and 14:29. It was a great run. I started the run talking with my neighbor, who has been running around the neighborhood for years. He was very encouraging and so I started on a very positive note. My Ipod was playing Dwight Yoakim's 'Pocket of a Clown'. We didn't run together. I didn't want to slow anyone down. I will probably run with other people once I feel like I can run 3 miles without needing any walk time. I did think less about my running last night, which helped me run longer. It was also nice that I got to run after the rain. It was much cooler and windy. 85* with 58% humidity. I taped the Cincinnati Reds game to watch after my run. they scored 4 in the 8th to beat Houston 4-3. What a night! August 18th was the first 1 mile race. I was the only participant. So I WON! In a time of 11:30, a personal record. After this race, I did a second mile of 15:49 and a third mile of 17:32. I ran around 8 pm in 90+ weather. It was dry with humidity in the mid 30's. I felt great after the first mile, but then my left achilles started to bother me. I walked the last mile. That makes 12 miles for the week. Another personal best. My weight on Sunday was 252, a slight gain from last week. Today, it is 247.5 (my digital scale does half pounds). My goals for this week were to run 15 miles and weight 248 or less. I made weight and did 12 miles. I could go and do 3 miles tonight, which was the plan. But, if my leg doesn't get any better, I'll take the night off. I doubt it will be better by tonight. A couple of weeks ago, I had the same pain. a couple days of rest did wonders and I improved afterwards. I used my Ipod to do splits or laps. I wanted to break 40 minutes for 3 miles. My first mile was 12:24 with my son tyler. It was the fastest we've run together. The second mile was 13:20, still respectable for me. Tyler made it half way and then walked home. At the beginning of the third mile, I hit a wall. I walked most of it and did a 17:21 for a total of 43:06. It was a good workout eventhought I didn't do a sub 40. Next time. That makes three runs this week of 3 miles each. My pulse at the end of the run was 116. That's the highest I've been able to get it up to. Tonite was the fifth time I ran 3 times around my one mile route. I've reduced my time from 47 minutes to 45 to 44 and tonite I was at 40.05. I've been guess how much of the 3 miles I actually run. But, It's easier to keep track of my time. The more I run, the less time it will take. I still am running less than 2 of the 3 miles. But tonite I felt like I ran more often and harder. I would run for a minute or two and then walk a bit. I don't have a watch to keep track of the time. I use my Ipod stopwatch. It's a bit combersome, since I have to take it out of my fanny pack to read it each time. I think it's time to buy a watch/heart rate monitor combo. I now have a goal to do 3 miles in under 36 minutes. A 12 minute pace. I took Sunday off and my legs felt great today. Even when I ran they felt ok. Tyler ran with me. We did 3 laps of my 1 mile loop. Ran about half of the distance at a 14.50 pace. It was 84* and 54 Humidity at around 8 pm. I'm reading "Anything for a T-Shirt", the story of Fred LeBow and his New York Marathon. He lead an impressive life and the NYC Marathon is something else. Hopefully, down the road I might run in a marathon. Today, I'd like to run in any race. A couple of 5k's are coming up and I think I might be ready by the time they happen. In Arizona that's alot. I like it because I sweat more and I feel like I accomplished more. Am I losing more real weight when I sweat more? Or is it just temporary water weight? I'll have to read up on that. It's 88 degrees at 9 pm when I ran. I did read up on heart rates. My standing heart rate is around 60. My doctor always said that my blood pressure was great. I got my heart rate up to around 96 during the run. I seemed like I was really working hard then. But it's only 55%. I'm supposed to get it over 60%. I stopped running about 1/2 hour ago and my pulse is still around 88. But, I don't feel like it's racing. I ran 3 miles tonight. About half of it was running. Lots of walking, but I seemed to be running more each night. It took me about 47 minutes. I gained a bit of weight as I weighed 250.5 lbs this morning. It must have been the Cheesburger combo at Wendys. I also bought the runner's world training dairy to monitor my workouts. I now have a course that is 1 mile long. I ran it 3 times tonight. Actually, it was probably 1 mile running, 2 miles of walking. It took me 45 minutes. I'd like to get it down to 30 minutes, which would mean that I am running most of it. In the last mile I was doing a good job of telling myself that I would run to the next bush. When I got to it I would pick another bush 10 yards further. It seemed to help me keep going. I seem to have some trouble concentrating on a topic when I run. I tried to go over the events of the day while I was running, but I just couldn't concentrate for more than a few moments. I think if I can train myself to think of something other than running, I will be able to run much further. I started in June and have run/walked up to 3 1/3 miles, but tonight was the first time I ran a mile straight. My achilles felt fine and I didn't have any other pains. But, I was winded. I walked 2/3 of a mile afterwards. The mile was 11:43 and the total time was around 25 minutes. I stretched afterwards. I started my run around 7 pm at night. The sun was down, but it wasn't real dark. I past several walkers, some with dogs. Luckily, I was able to run past them. My son likes to tease me by walking quickly beside me. The temperature was around 93* and the humidity was 35%. Today started out great. 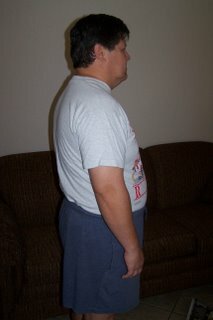 I weighed in at 248 lbs, down 2 lbs. from the day before and down around 9 lbs total. After dinner I mowed the lawn. Then I went to the batting cages. Softball starts in one month and I haven't hit for awhile. I got a good workout in the cages and even hit some fastpitch around 60 mph. It wasn't pretty, but we have a while before the first game. I came home and ran with my son. 20 minutes of running around the block. We ran non-stop for 2/3 of a mile and then walked for 2/3 of a mile. He could have ran more, but I was ready to take it easy. My achilles didn't bother me, but I didn't want it to flair up by over doing it. I stretched after the run. Hopefully within the next week I will be able to run a mile non-stop. I run at night after the sun has set and it's cooler in the desert we call home. But, last night it was 7 pm and I was ready for bed. Whenever, I go to sleep that early I always wake up. So, I planned to take a nap for 1-2 hours and then maybe run. Of course, I taped the Reds/Cardinals game to watch, as well. Sure enough I woke up around 9 but was still tired. I chose to watch the Reds game ( I love the Reds) and ride the exercise bike. The Reds game was dreadful. The Cards went up 7 zip in the first two ininngs and I lost interest. As I rode the bike, I concentrated on my workout thoughts. Normally, I try to think about other things besides being tired and wanting to stop running or biking. I listen to my Ipod or I think about golf, baseball, etc when I run. When I ride the exercise bike I watch tv. the Reds game was not keeping my attention. I rode for 40 minutes and 7.7 miles. During the ride I noticed I was always thinking about finishing. When I get to 4 miles I'm gonna stop. When I get to 30 minutes, I'm gonna stop. I need to change my thinking. Not sure what I should do when I start getting those thoughts. I'll come up with something. I did stop to do some stretching. In the 'Beginners Guide to Running' it gave me some good stretching ideas. I will stretch after every run now on. Last night I ran/walked 10 laps around my block. The block is about1/3 of a mile. I consider 10 laps to be equal to a 5K. My calf is still a bit sore, so I did mostly walking. I might have run about 1/3 of the distance or 1 mile off and on. I finished in 53 minutes and worked up a decent sweat. I read in 'Beginning Running' that the pain maybe associated with my achille's tendon. It's just in my left calf which is usually the leg near the curb. I run on asphalt on a street that is crowned slightly in the middle. I have been running near the curb. I think that the slant of the street has something to do with the soreness. I don't want to run in the middle of the street, since it is dark and I have my ipod playing. I might move a bit more to the center. I usually see car lights and hear some engine noise, so I think I'll be fine. 11 year old Brooke has a rare bone cancer called Osteosarcoma. She has been staying at Phoenix Children¿s Hospital to have chemotherapy every week for nine months. She is scheduled to have her bone and knee replaced in June, which may require several surgeries. The bone replacement, along with chemotherapy, will require money over and above what insurance will cover. In addition, her parents have to take a lot of unpaid time off of work to care for her and take her to treatments at the hospital. Please run or walk with us to support Brooke and her family during this difficult time. The left calf felt much better. I was able to do a slow jog for 2/3 of a mile and then walked for another mile. If I kept running, I think I would have reinjured the calf. My other leg feels fine, both feet feel fine and I'm less winded when I run. I did time myself and I was out there for 30 minutes. I finished reading John "The Penguin" Bingham's book "The Courage to Start". I highly recommend it. My favorite quote from The Penguin and I'm sure it's a favorite of a lot of people is, "the miracle isn't that I finished. The miracle is that I had the courage to start". Now I'm reading "Beginning Running" by Amby Burfoot of Runner's World Magazine and "How Running Changed My Life", a collection of true stories about running edited by Garth Battista. I took another day off from running to see if my calf pain would calm down. It has greatly and my left leg almost feels back to normal. I don't know if another day is needed or if I should run tonight. I'll probably test it cause I'm itching to run some. I weighted in yesterday and today at 250.5 lbs. Down another pound. I'm also itching to get down in the 240's. I've decided to start my own racing series. It will be a monthly event starting with a mile run and then lunch somewhere fun. The August Fun Run will be on the 18th and is open only to me. I think I'll have a better chance of winning. It will be timed. Anyone that wants to run a race on the same day can add a comment stating their time, how long they've run for, city, weather conditions and anything else that is of interest. 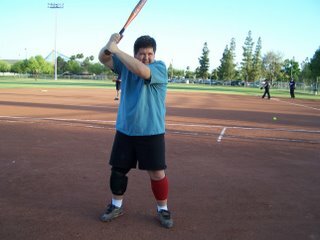 Here's a couple softball photos of me. I used to play a couple times a week on both men's and coed teams. Now it's down to Friday nights with my church team. I pitch and do a little hitting. Our team does it's best, but we lose as much as we win. We always have fun. I took one day off and my calf was feeling better. Tonite I tried to run, but I made it about 5 steps before the pain returned. I could walk with only a bit of pain. So I walked for about 2 miles. 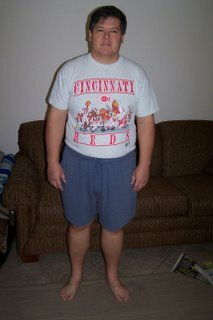 When I started this running thing, I weighed 256.5 lbs. (My digital scale measures to the half pound). This morning I weighed 251.5. I'd really like to get below the 250 mark as soon as possible. Then the march toward 200 lbs. 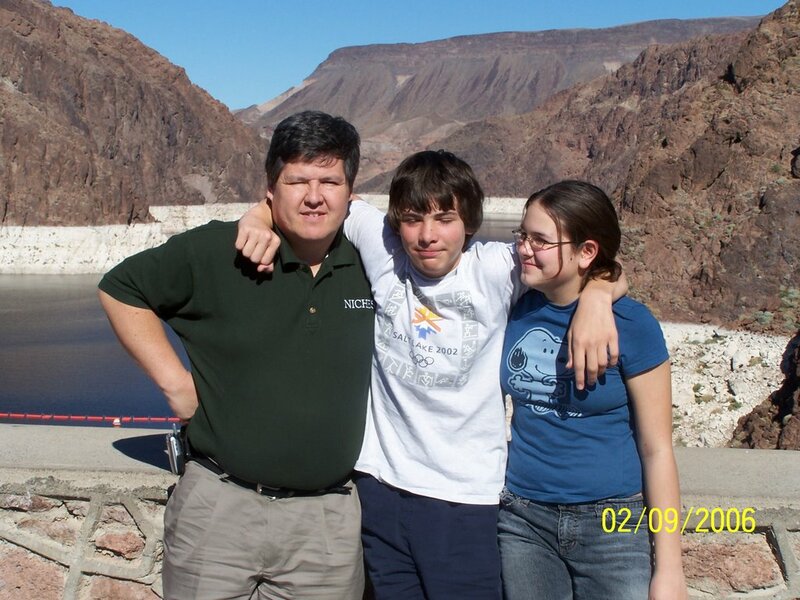 The photo is of my kids and me. Amy, my wife manned the camera. She, like my kids tend to be on the slender side. Tyler and Emily run some with me. Amy has some back issues so she walks. The photo is at Hoover Dam. The water should be at the top of the bathtub ring or white. I guess you call it a drought. the past posts were all written on the day I opened this blog. From now on, I should be writing current information. I decided i needed an ipod for those times I run alone. My son and daughter have run with me and we talk and I like that. But, they don't always run with me. I bought an ipod like my daughters. A nano. I have used it twice now. I run around 8 or 9 pm in the dark around a block that is 1/3 of a mile. At first I could run one lap, then walk a lap, then run 1/2 a lap and walk the final 1/2 lap. Last night I ran 2 laps and walked/jogged the final lap. Soon I will be able to run the full 3 laps for a mile. It was cooler yesterday. In the 90's for the high and I'm thinking it was around 90 when I ran. Much cooler than last week. I've felt some discomfort in my left calf the last couple times I ran. Last night it hurt a bit more after the two laps. I iced it when I got home. Today it hurts when I walk, but I'm sure it will get better. I think it's a bit of tendenitis (?). I'll take today off and see how it feels tomorrow. We had a vacation planned for the last week in June. We went to Indiana and spent time with my in laws in West Lafayette. I brought my running shoes. I didn't run as much as I should have, but I did run over to Purdue University and it's football stadium. It was about 6/10 of a mile and I ran about half of it. The stadium was open so I went inside and ran the steps from field level to the top. 120 feet up and I walked down the next stairway. Rested and ran up the next aisle. I ran up three aisles, before I was spent. It was neat to be in the stadium and I think I will try to do this at other college football stadiums too. I then went and rested in the basketball arena and watch some kids basketball camp. Finally, I walked/jogged back to my mother in laws home. It was a good work out and I enjoyed it. We then went to Cincinnati, Ohio to visit my folks. My son was in the Junior Olympic Archery National Tournament in Lebanon, Ohio so we timed the trip to visit family. He shot his personal best in the tournament. My father has a treadmill and I had not really run on a treadmill for any length of time. The only other time was to buy running shoes a few weeks earlier. While in Cincinnati I ran on my dad's treadmill a few times up to one mile. It' easier running on a treadmill. I watched the Reds games will I ran. I remember in the second week of running I made it to the end of the block. jogging all the way. My kids will sometimes jog with me. They are in much better shape. My son will sometimes walf quickly beside me as I am running and tease me. I bragged about making it to the end of the block. I use google earth to get my distances and it's pretty accurate. It's .22 miles or 14,162 inches of running. Or twice as far I could run non-stop the first day. I finish my 1/2 mile circuit by walking. I know it's not far, but I am enjoying it and that's one of my goals. I run 3-5 times a week. I went to a store near Arizona State University. They specialize in running shoes for runners. They had me get on a treadmill and walk. They videoed my feet. Then I ran and they videod some more. They recommended three shoes and I tried them out. I even ran with them on their treadmill. I picked some New Balance 857 High Stability Trainers. These shoes have been wonderful. I have been using them for over a month and I have not had any issues with sore feet or shin splints. OK, I sometimes get minor aches and pains, but nothing serious. 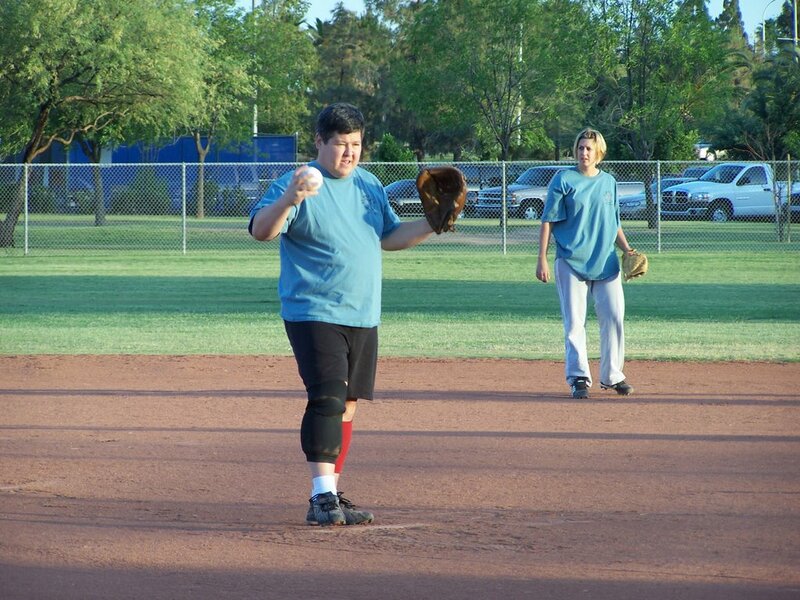 I play softball on Friday nights. One night I hit a ball in the gap and ran from home to home as fast as I could. I hestitate to call it a home run, because the outfielders played a large part in slowly getting to the ball. They probably should consider running too. Anyway, after my big hit I got to the bench and was breathing about as hard as I ever have. I was fine, I just could not get enough oxygen into my lungs. I've had this problem my whole life. I remember it well in high school football. Back then, I just assumed I was out of shape. But, it's more than that. I have exercised induced asthma and my airways just don't open up like other peoples do. I stop running because I need to breath more than because my legs hurt or I mentally need to stop. After the softball games I started to stick around and run in the grass out past the home run fence. It is about 1/10 of a mile from foul pole to foul pole in a nice slow arc. I can run, watch some softball and run some more. I like it because the grass is softer than the roads and it gives me something to watch. My feet and legs don't hurt nearly as much either. I still plan to buy some good running shoes. I don't remember why I wanted to start running. I know I need to lose weight and that is part of the reason. I just remember sometime in the beginning of June, 2006 I got my gym shoes on and went out side late at night and ran. I had watched Forrest Gump on TV. Maybe that's why. One day he just started running and as the story goes he ran for years non-stop. Well, on my first day I ran about 10 houses. Then I walked. It was after dark. I live in Chandler, Arizona and it was probably over 100 degrees. I sweated. A lot. I didn't have a water bottle, which would have been nice. But, I didn't go to far from home either. I probably put in 1/2 a mile or maybe a bit more. My shins hurt (shin splints? ), my breathing was labored (asthma?) but I was happy to be moving. 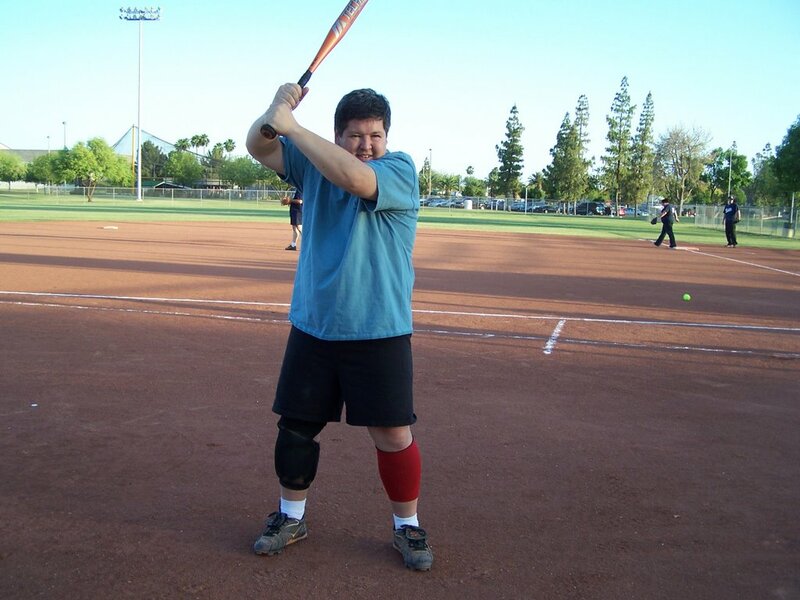 I play softball and do a lot of walking in my job (REALTOR®), so I am somewhat active, but running has always taken a lot out of me. I can get on the exercise bike and ride for half an hour more without getting nearly as winded as I do when I run. I have exercised induced asthma and the up and down jostling in jogging makes it tough for me. But I will endure. I decided to buy running shoes. I've always liked playing sports. I played football, basketball, baseball and wrestled when I was young at various levels. In college I played football for the first two years but continued to play intermural sports. Now, as an older adult I want to stay active. A few years back I got involved in softball, which I love to play. My son has gotten me involved in archery which is competitive, but not very cardio. You only sweat if it's a hot day. Now, I am running. Maybe you'd say it's jogging. My goal is to always enjoy my time jogging. I don't need to train so hard that it is not fun. I'll push myself a bit, because I enjoy that. But, I won't run until it hurts. I don't have any problems running and stopping and running some more. I would like to increase my distances. Maybe run a 10k or a half marathon. Maybe a full marathon some day. But, I'd rather run a half marathon and enjoy it than run a full one when the only thing I can feel good about is finishing. Of course, I would like to be in better shape from this running. I need to lose weight. I need to feel confident that I am not killing myself from a sedentary life. Today, my left calf is bothering me. I don't believe I am hurt, just a bit sore from running lately. I want to run today, but I will take the day off. Another goal is to always want to run. This is my first post for my running blog. I've been running for about a month now and have made progress. In the next few posts I will tell about the last month and what I have experienced. From buying running shoes, to jogging at softball games, to jogging a block to jogging the steps at Purdue's Football Stadium. I'm a new runner, so any advice is greatly appreciated.